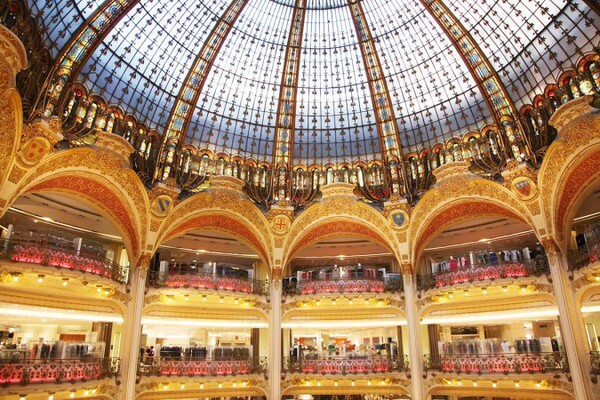 Apple may be building a stand for the Apple Watch at Galeries Lafayette, a high-end department store located on Boulevard Haussmann in Paris, according to a few news outlets based in France. Mac4Ever [Google Translate] reports that the stand would reside on the first floor of the department store, with possible expansion to other stores along the Avenue des Champs-Élysées. Mac4Ever claims the current construction on the stand, which began at the beginning of February, is hidden as workers finish it up ahead of the Apple Watch launch in April. They also report that Angela Ahrendts, Apple's new retail chief, oversaw the setting up of the display and general organizational duties concerning the project. The fashion-focused FashionMag.com [Google Translate] added more details onto the rumor, and a slightly clearer picture of the ongoing construction of the possible Apple-leased space. 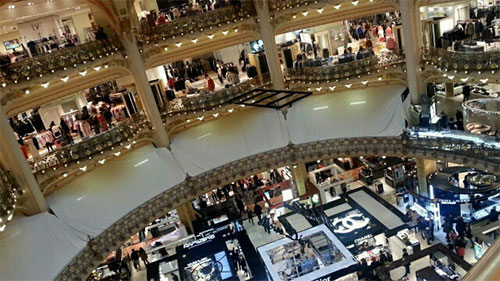 The site reports that the project has taken the place of a small food court and a few lesser-known jewelry shops, and spans four balconies within the Galeries Lafayette. From what they could tell, it's located near the stores of Celine Saint Laurent and Miu Miu. As the Apple Watch nears its launch date, news and rumors on Apple's first wearable device have picked up steam. Most recently it was announced to be featured on the March cover of Self magazine on the wrist of model and Victoria's Secret Angel Candice Swanepoel. Apple has also reportedly placed between 5 and 6 million orders for the initial run of the Watch, with the most expensive gold Apple Watch Edition expected to dominate the revenue of the wearable, despite having the least amount of orders placed compared to the lower tiers of the Watch. Because they can afford it (or are OK with racking up debt). It really is as simple as that. There are luxuries in life that will never be understood by others. Some people don't blink about a $400 dinner for 2.
some people will spend $400,000 on a boat that gets used 5x a year. Don't try to wrap your head around it. I don't get why Apple is going for a fashion angle over a tech angle. Because Apple's non-tech customers vastly outnumber the techie ones. Apple Marketing = Genius. No one can touch them in that department. What other marketing/ads "appear to be for the rich"? Self magazine? Yes - only the rich read about fitness. Perfect place to launch the iWatch. Apple sure is putting a lot of lipstick on this pig. I own multiple luxury watches, works in tech, and is a big apple fan. But i just can't see myself buying this thing. The simple fact that something so timeless will be outdated in a few months just does not connect with me. This reminds me of the aftermarket gold iphones. Luxury and fashion should be timeless, with a sense of history of you owning it. Not something you throw out for a new, updated version every year. Especially when you KNOW this first gen model is gonna be lacking in features. Because it will sell.... a lot...just like they sell ipod and associate with musicians and artists. The same way they spend 2x the avg per capita income on a luxury car that will depreciate by 10-20K the second they drive it off the lot and another 30K the two years after that. The same way they buy $10K dresses for ONE occasion. There are a lot of very wealthy people in this world. Maybe not on your block but they exist just the same. It's absolutely nothing on them to get $5K bottle service in Vegas. You really think they are sweating a $4K watch that makes a statement?